In , 0% of the area within a 1-mile radius of , was actively being strip mined. Mountaintop removal coal mining occurs within 0 feet of the community. The population in this community has changed by 0% since 1990. This compares to a change of 0% for the county and 0% for the state. High resolution satellite imagery is currently not available for this area. 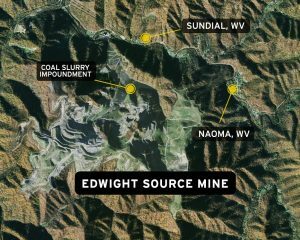 As of the end of November, Alpha Natural Resources will have idled two of its coal mines near the community of Naoma, W.Va, citing “adverse market conditions” as their reason in both instances. In early October, 92 miners received notice of the impending layoffs. The decision follows Alpha’s filing for Chapter 11 bankruptcy in August. 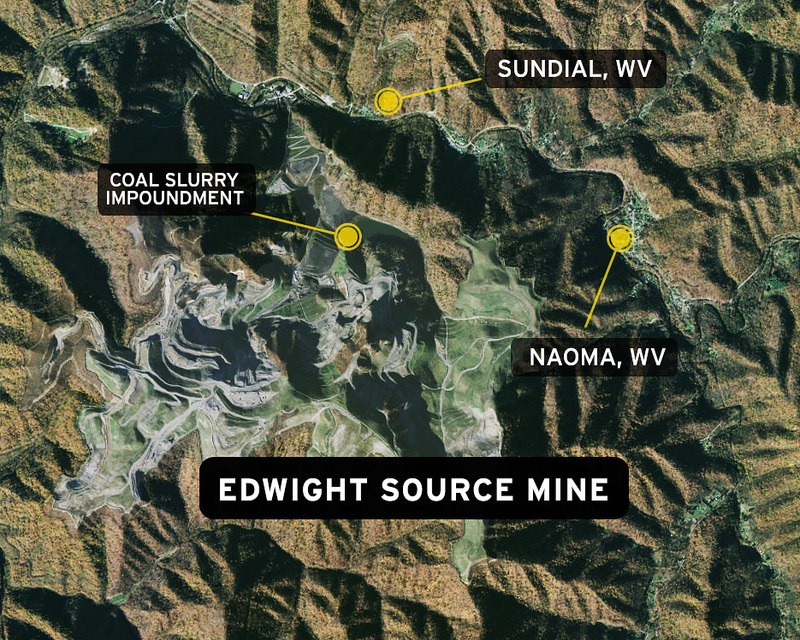 One of the mines, the Edwight Source mountaintop removal mine, has affected several nearby communities in addition to Naoma, such as Sundial, Pettry Bottom and Edwight. The 2.8 billion gallon Shumate coal sludge impoundment is located 400 feet above the now­-abandoned Marsh Fork Elementary School in Sundial. An aerial drone video from Coal River Mountain Watch shows the Edwight Source Mine and Shumate coal sludge impoundment in fall 2015. The Shumate coal sludge pond, which holds roughly twenty times the amount of coal sludge that was released in the fatal Buffalo Creek flood of 1972, is fed by Alpha’s Goals prep plant. It remains to be seen whether Alpha will idle operations at this prep plant. The impoundment is listed by the West Virginia Department of Environmental Protection as a Class C dam — the type of dam “located where failure may cause a loss of human life or serious damage to [buildings and roads].” A report by the Office of Surface Mining and Reclamation found that if the Shumate impoundment were to fail, it would release a wall of sludge more than 20 feet high. Within five minutes, the sludge would reach the community of Edwight a half-­mile downstream. Mine Safety and Health Administration officials have also cited the dam for safety violations on multiple occasions. In April of this year, Appalachian Voices published a study of 50 communities in central Appalachia that are similarly “at risk” of the worst impacts of mountaintop removal coal mining. According to Vernon Haltom, executive director of Naoma-­based Coal River Mountain Watch, these risks do not often get reported in local, or even national, media. Haltom references a recent New York Times article that claims “mountaintop removal…has all but ground to a halt.” “I wish somebody would tell Alpha that,” Haltom says. He points out that, although Alpha is idling its Edwight mine and recently filed for bankruptcy, it is still applying for permits in the area, including a new mountaintop removal mine one mile upstream from Sundial.